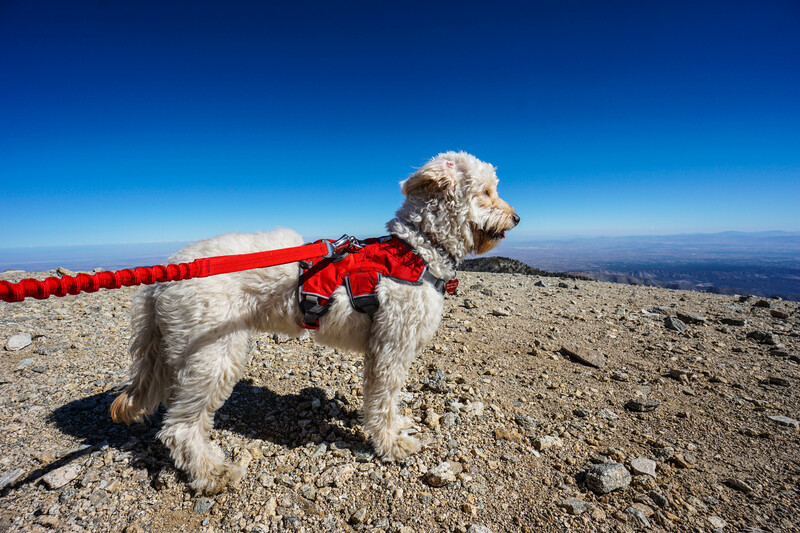 So you’re looking to make your pup an official hiker, but you don’t know where to start. The options are endless, with special jackets, booties, doggles, leashes, and collars. In my opinion, the most important piece of gear for a dog, and the first you should consider, is a quality harness. A standard dog collar will work just fine if you only plan on taking your dog for the casual stroll around the block, but if you plan on hiking and exploring the world with your canine companion, you’ll definitely need to invest in a quality harness. The great thing about a harness is that you won’t have to worry about any pinching or choking, as it provides a safer and more comfortable point of attachment for your pet. This is especially important if your dog is small, pulls, or is not one to ignore distractions. A good harness will distribute the forces evenly throughout the dogs body, as opposed to just pulling on its neck, throat, and spine. Dogs are also less likely to maneuver out of a harness, as some are wont to do in a collar. Finally, and one of my favorites, is that some harnesses come with a handle. When hiking with Isla, there are times when a step or a jump is too great for her legs to handle. In these cases, I can grab the handle on her harness, and safely move her along the trail. There are many quality harnesses out there, but the one I’ve found to be the best is the Ruffwear Web Master Harness. The Webmaster Harness is very well made and extremely comfortable. Isla has an interesting build that’s common for a goldendoodle, with a narrow and deep rib cage and skinny waist. The 5 points of adjustment on the Webmaster allow me to dial things in perfectly, and get a comfortable fit that’s secure without chaffing. As you can see in the image above, the straps that conform to the rib cage and belly are padded and smooth. This does a great job of minimizing any chaffing that could occur with an uncovered belt. On the top of the harness is a V-ring leash attachment, a webbing loop, and a handle. The V-ring leash attachment is very high quality and articulates well, meaning there’s no binding of the leash clip. The webbing loop is great for evening hikes or walks, as you can attach a light that won’t get in the way of your dog. The handle, as I mentioned earlier, is my favorite feature. It is very high quality, and allows me to take Isla where other dogs would struggle greatly. If you’re looking for a great hiking harness for adventures with your dog, I would highly recommend the Ruffwear Web Master Harness. There is a reason why this is the harness of choice by avalanche rescue teams. Isla has been using this harness for a year of heavy use and it hardly shows any wear. We expect to get many more great years out of this investment and wouldn’t hike without it. Hi Drew, after doing research everywhere, I thought I might just ask a hiking enthusiast that has a doodle. We ordered some Ruffwear harnesses and our doodle has the same body as yours. Her ribcage is 56 cm (so we are exactly in-between the two sizes XS and S). She is 50cm tall. XS seems way too tiny and S a bit to big. We f.e. can’t adjust the front buckles further. Which size are your doodles and have you experiences the same issues? And what decision did you make, if so? Hello! We had that issue with Isla. Lilly is 21lbs, so the XS was perfect. Isla is 30 lbs and the XS was too tight. The S was a little large, but with the straps pulled all the way in, it doesn’t move too much.